I’ve had a good day although it must look like I haven’t done that much. 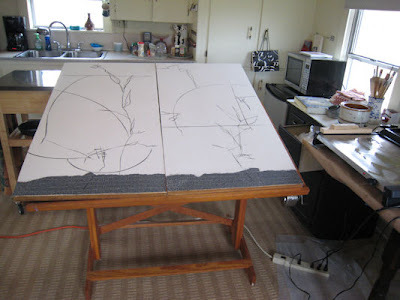 Those of you who work with encaustic know that working on 24 x 48″ panels takes a little more time than throwing some acrylic around for one layer. There are two panels here. I decided to load them all to a folder in Picasa for viewing. There are labels for each picture. As I mentioned before…I mounted watercolor paper to these panels so that wax would absorb into the surface. I was afraid the old surface might not work for wax painting. I had space left at each end so I put some paper I found that probably came from all those gorgeous papers I find at art supply stores. I tore off some charcoal colored heavy paper and mounted it at the bottoms. OK..where to go from here?? Guess I’ll just do what I do with other paintings while forgoing the toning I usually do………I get out the willow charcoal and just make marks. Whatever marks are my marks for the day…just depends on the mood. I don’t analyze it or put any intellectual thought into what kind of mark I’m going to make. You can cover it up later if you want to anyway. One good thing about encaustic and acrylic painting…guess that is my attraction to both mediums. I’m also attracted to the use of collaged elements in paintings and with wax, no glue is needed since the wax with hold it down…and you can cover as much or little as you like. I don’t know yet if there will be any more added or not but for unity, there probably will be some since that is a heavy element there in the bottom of the picture plane right now. One bad about having a panels with hangers already on them…might make for a problem if I like them better horizontal or upside down. Oh well…I will face that problem if it arises later. I can remove those hangers and move them for sure. Humm..now to dream…what color or no color or what?? Guess I’ll find out as I go.